Whatever your vital statistics, the new Profile cut is perfect for you. It’s more youthful, slimmer and more modern. When it comes to suits and sport jackets, traditional may be tried and true, but it’s time to opt for something newer. Profile’s traced jacket waist, narrower lapels and tapered plain front trousers can be customized to flatter any body type or age. Feel good and project a look of confidence because you will look younger, taller, thinner and sharper in the Profile suit or jacket made from Gladson’s hand-picked fabrics. 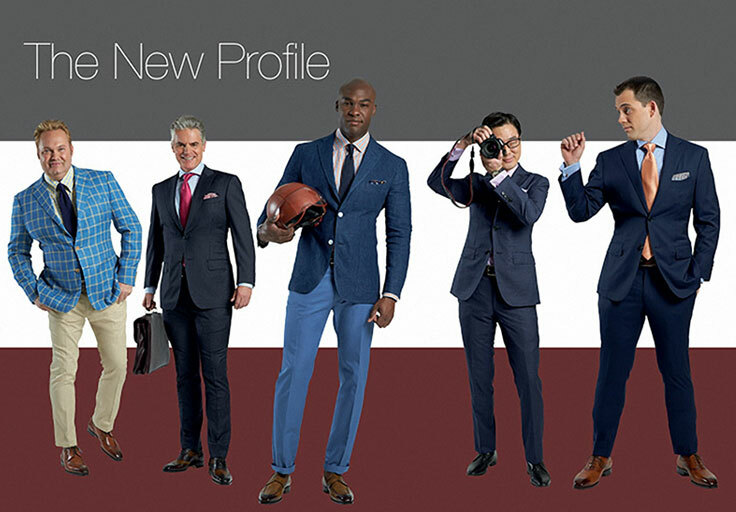 The sharper silhouette works for every body type ... stout, slim, tall or short. Looks good in small scale suit patterns as well as bolder sport jacket designs. Breathe new life into your wardrobe and enjoy the compliments that will come your way like, “Have you lost weight? Have you had some work done?” Your secret is safe with your tailor. Ask any well dressed man today what his secret is, and his answer will most likely be “my tailor”. The Profile Collection is exclusive to HMS and may be purchased only from Gladson Ltd. Behind the scenes at the Profile shoot.